Pictured above is a very small sample of some of the alligator clips that I have created. My inventory changes all the time based on a new ribbon I have found, or a new outfit for my daughter that I needed to create a bow for, or a new technique I just had to try! Email me for a current photo of what I have in stock. 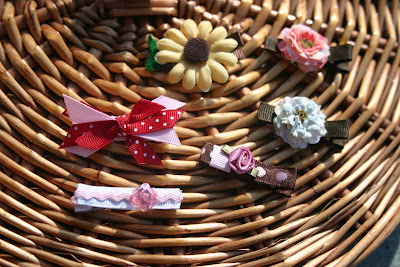 All alligator clips are partially lined and have a non slip grip added to unsure they will stay in the finest of hair.